Recycled Newspaper Ballpoint Pen has a white colour body with a black cap and black ink. This environmentally friendly newspaper pen is an exceptional value. Miles of trouble free writing. A one colour only imprint is available on the newspaper pencil. 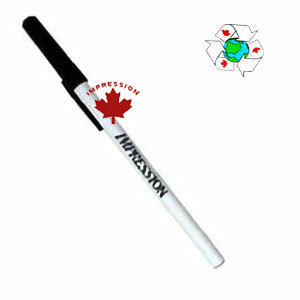 Imprint Area: 2 inch x 5/8 inch, one colour imprint only (a wrap design imprint is available on this pen). The ground up newspaper is mixed with other recyclable materials to manufacture this pen. 1 Colour imprint included $0.99 $0.87 $0.39 $0.38 each.